The UN High-level Panel on the Post-2015 Development Agenda (HLP) briefed UN Member States on the process and substance of the Panel's report, which is titled 'A New Global Partnership: Eradicate Poverty and Transform Economies Through Sustainable Development.' The report had been submitted to UN Secretary-General Ban Ki-moon earlier in the day. 30 May 2013: The UN High-level Panel on the Post-2015 Development Agenda (HLP) briefed UN Member States on the process and substance of the Panel’s report, which is titled ‘A New Global Partnership: Eradicate Poverty and Transform Economies Through Sustainable Development.’ The report had been submitted to UN Secretary-General Ban Ki-moon earlier in the day. Opening the informal, closed meeting of the UN General Assembly (UNGA) on 30 May 2013, at UN Headquarters in New York, US, UNGA President Vuk Jeremic expressed his hope that the HLP report will serve as a “wake-up call” on the dynamism required to fulfill the mandates given to the UNGA by the UN Conference on Sustainable Development (UNCSD, or Rio+20). He also noted the need to address how to make a smooth transition from the Millennium Development Goals (MDGs) to the Sustainable Development Goals (SDGs), and highlighted the forthcoming UNGA Special Event to follow up on efforts toward achieving the MDGs, on 25 September 2013, which he said will be the final occasion for leaders to decide on actions that need to be taken to complete the MDG process. Finally, Jeremic argued that the MDGs as a whole must become the first SDG. Susilo Bambang Yudhoyono, President of Indonesia, said the Panel had interacted with over 5000 organizations, hearing from farmers, migrants, people with disabilities, small business owners, women entrepreneurs, young people and children, and informal sector workers, about their aspirations for 2030 and how to reach them. On the substance of the report, he said it calls for ending extreme poverty in the context of sustainable development and sustainable growth with equity. This will require a “genuine global partnership,” he said, in which all stakeholders have a sense of common purpose and act in the common interest. 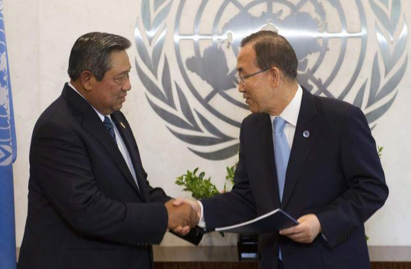 Yudhoyono also listed the 12 example goals included in the report, which he said are not meant to dictate the eventual development goals, which must be determined by Member States, but illustrate the issues that need to be prioritized. Florence Chenoweth, Minister of Agriculture of Liberia, in a statement on behalf of President Ellen Johnson Sirleaf, Co-Chair of the HLP, said the report reflects the aspirations of the world’s people and that the President would continue to listen. Justine Greening, UK Member of Parliament and Secretary of State, represented David Cameron, Prime Minister and HLP Co-Chair. Greening said the bedrock of sustainable development must be the rule of law, absence of conflict and corruption, and accountable governments and institutions, which are essential for tackling the causes of poverty. She called for an inclusive, transparent process between now and January 2016, and said the Open Working Group (OWG) on the SDGs will be a major chapter in that process. Ban Ki-moon highlighted the report’s messages that: the post-2015 development agenda should be universal, applying to North and South alike; sustainable development must be firmly at the center of the post-2015 development agenda; and peace and good governance are a core foundation for development. Ban also expressed his hope that the Special Event will provide a road map to 2015, including a possible date for a High-Level Summit on Post-2015. Cote d’Ivoire, on behalf of African States, said a development framework addressing the root causes of poverty is of utmost importance to the African Group. He expressed concern about developed countries’ reluctance to adhere to commitments, and the systematic attempt to renegotiate previous commitments, calling on development partners to honor aid commitments. In addition, the global partnership in a post-2015 development framework should incorporate resources from “new actors” to support technology development and build African economies. Saudi Arabia, on behalf of Asia and Pacific States, noted the economic diversity within his region, which is interested “more than anyone else” in a comprehensive, balanced and equitable framework of development that ensures sustainability while effectively addressing challenges of poverty eradication, economic development and climate change. He said the Group embraces the national and thematic consultations, but progress can only be achieved through the intergovernmental process, as represented through OWG. He called for all elements of the MDGs to be vigorously pursued in the next two and a half years. Greece, on behalf of the Group of Western European and Other States, stressed the demand for a global political commitment and coordinated action by all countries, including to address inequalities within and among countries. Engaging in the wider post-2015 agenda, including agreeing a post-2015 framework, is a high priority for the Group, he said.